MediaMall is a powerful solution to manage online media distribution and digital products that can handle third party sellers or artists publishing their media or downloadable goods. Having a built-in Credit System authors can earn money from their sale and your website can keep a certain percent. Media mall is a dedicated e-store for digital downloads which you can make work in just a few clicks. 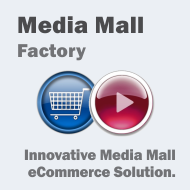 You can test Media Mall Factory by clicking the menu on the left, and check out the administrative backend by clicking on the menu on top. You can easily build Tutorial Websites, Video and Picture packs selling sites or Music selling websites in just a few clicks. The built-in player will allow users that have bought the media to watch/listen - the webmaster can set up a limited or unlimited number of views. archives (zip, rar, gz, bz2, arj, arc, '7z) - used generally for tutorials, image packs or music packs. Also a user can post a free sample video and put the full tutorial as an attached archive. In order to purchase the credits easier the system provides several payment gateways - Paypal, Moneybookers, Authorize and SagePay integration. Clean payments are transformed automatically into credits. A further income method, if enabled, can be the pay for Contact. Users can pay in order to contact authors. Your website will earn a percentage of every transaction. The administrator can create and manage endless Categories, can set a fixed price for any media or let the authors choose their own pricing scheme, can manage user credits and can approve media uploads (you can enable also auto-approve for specific user groups). Another important administrator feature is the author payments management. The system also includes mail notifications on certain actions. Viewers can use the integrated Rating System to rate and also place comments for any media file. This is allowed for free media files and for commercial media files only after viewing/listening/playing the media - in order to avoid any abuses. Surely the media files can be also posted for free, allowing your users to play it without any credit purchase. The administrator can configure this allowing the view for guest or logged users.